Welcome NPS Staff and Volunteers! List of NPS units with NPOTA activity during NPS Centennial Week & Founder's Day. In parallel with the National Park Service’s Centennial in 2016, ARRL, the National Association for Amateur Radio (sometimes called ham radio) has organized a year-long event, National Parks on the Air (NPOTA), to help NPS celebrate its Centennial. Amateur Radio operators will be drawing worldwide attention to all NPS units by bringing in portable radio gear and making two-way radio contacts, without the need for traditional communications infrastructure, such as the internet or cell phones. This activity provides the public with a real-time “virtual visit” to NPS units in a way no other group can offer. View real-time statistics on how many two-way ham radio radio contacts ("QSOs") have been made this year from each NPOTA unit. Amateur Radio operators are very excited about celebrating the NPS Centennial. Much like National Parks, the airwaves are a natural resource shared by all. 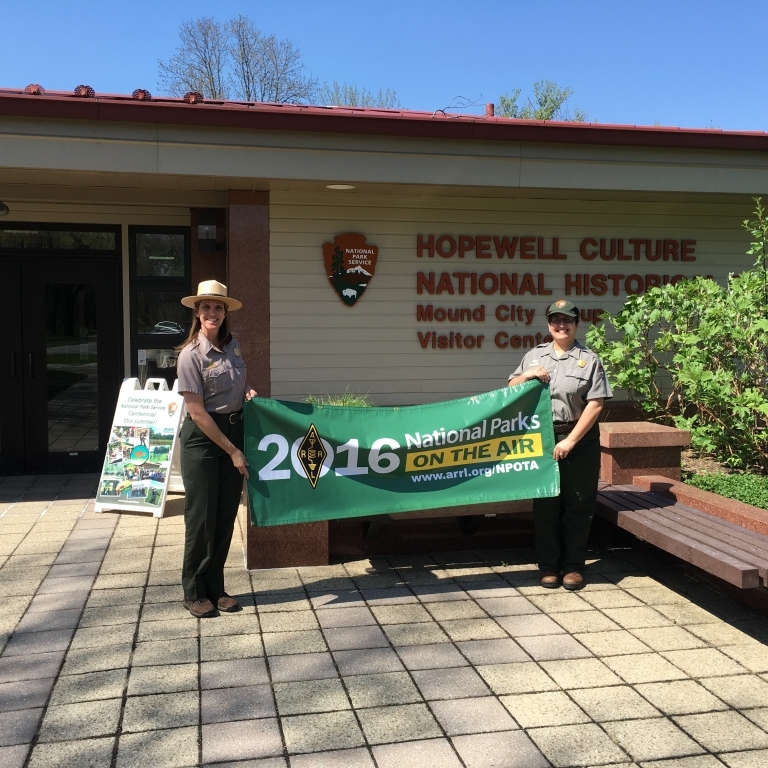 We look forward to using our “national park” to help NPS bring awareness to theirs in 2016. We hope this page will answer your questions about ham radio and the ARRL National Parks on the Air event. Amateur Radio is a hobby and public service where people set up and use two-way communications equipment. Over 750,000 Amateur Radio operators are licensed by the Federal Communications Commission, and are trained in communications techniques and basic electronics theory. It is fun, scientific, and educational. Amateur Radio has offered worldwide public service during times of need for the past century, and is recognized by FEMA and the American Red Cross as a critical communications network during natural disasters and other emergencies. ARRL has Memorandums of Agreement with both organizations. Temporary, portable operations are one of the ways in which ham radio operators train and prepare for such emergencies, and combine their recreational enjoyment of Amateur Radio with the great outdoors. How will NPOTA impact your NPS Unit? Minimally, if at all. Responsible ham radio operators have been bringing equipment to NPS units for many years, with no adverse impact on the units or other visitors. During the NPS Centennial, it is likely these ongoing activities will be more frequent. Most ham radio operations are small and unobtrusive; many hams can carry all the equipment they need in a backpack, or have a self-contained station in their vehicle, and their equipment requires no permanent installation of any kind. “Leave nothing but footprints” is well understood by radio amateurs who enjoy portable operating. Most hams will likely be interested in a “day trip,” or just a few hours of activity at most. Some will wish to stay longer, if camping is permitted at your unit. We are confident that the majority of these temporary setups will be small enough that they can set up in a corner of your NPS unit and have no impact on other visitors. Some Amateur Radio groups may wish to have a larger display of Amateur Radio’s capabilities and interact with the public; we have instructed such groups to pursue a Special Use Permit with the NPS unit in question. What information is ARRL giving to ham radio operators about NPS? ARRL has written a National Parks on the Air Activator's Guide, which emphasizes following NPS rules and policies when setting up temporary stations in NPS units. We stress safety and personal responsibility, not disrupting the enjoyment of others, cooperating with NPS staff, and respecting NPS authority over the unit. ARRL has a web page promoting the event at www.arrl.org/npota. Phone: 860-594-0200 M-F 8a-5p Eastern Time. Explain that you are an NPS employee at a park, and you have questions about National Parks on the Air. Questions regarding NPS rules and regulations should be directed to your regional office. Founded in 1914, the American Radio Relay League is the national association for Amateur Radio in the US. ARRL is the largest organization of radio amateurs in the United States and the primary source of information about what is going on in the ham radio world. ARRL offers books, news, support, information, special operating events, continuing education classes, and other benefits for its members.